Two months ago, I would have told you quite adamantly that I couldn't draw a straight line. My sister is the artist and I struggle drawing stick figures. But I've found with a little practice, a lot of patience, and getting over my hatred of writing with pencils, I'm getting better! I shared my first attempts HERE and HERE. 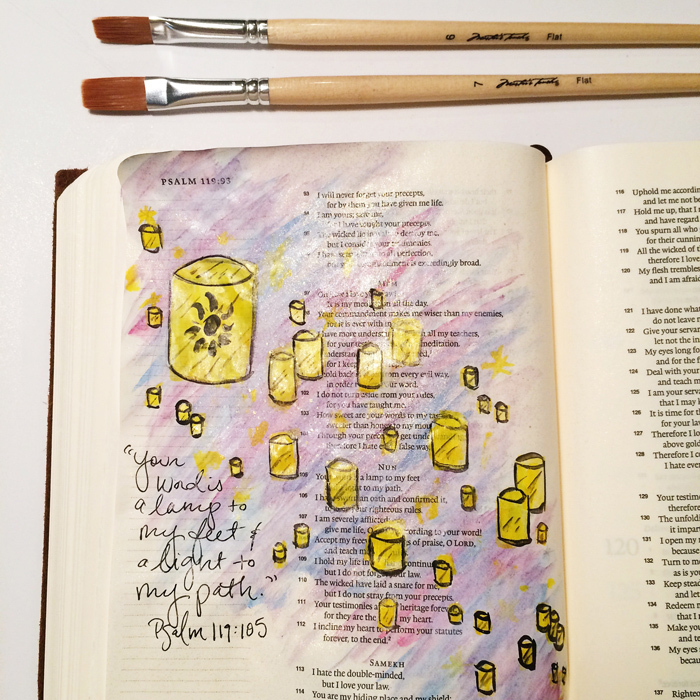 Now I love love love painting in my journaling Bible! It is truly transforming my days. And as far as details go, I started out with the black paint set and picked up the blue (36 colors!) at Hobby Lobby for $9.99 (before the coupon!). They all lock together for easy travel. Here are some of my favorites from the past few weeks. I took over the title page for the New Testament with this one. I already had a painting on Matthew 6, and I wanted to copy in the entire passage from The Message Version (a paraphrasing), and the title page had plenty of white space. I found an image on Tumblr with a similar shirt/boot combo and added to it to suit my fancy. The scripture came next and to my surprise it fit PERFECTLY! "Has anyone by fussing in the mirror gotten taller by so much as an inch? All this time and money wasted on fashion - do you think it makes that much difference? Instead of looking at the fashions, walk out into the fields and look at the wildflowers. 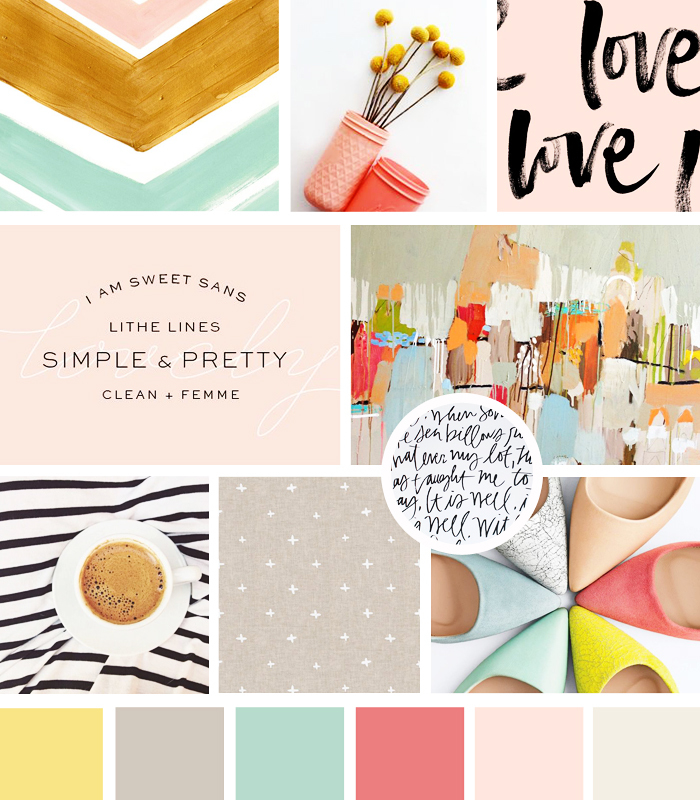 They never primp and shop, but have you ever seen color and design quite like it? The ten best dressed men and women in the country would look shabby alongside them. If God gives such attention to the appearance of wildflowers, don't you think He'll attend to you? What I'm trying to do here is get you to relax, to not be so preoccupied with getting, so you can respond to God's giving. Peoplw ho don't know Him or the way He works fuss over these things, but you know both God and how He works. Steep your life in God-reality, God-initiative, God-provisions. Don't worry about missing out. You'll find your everyday human concerns will be met." Next came this guy which is probably my favorite. I get the feeling iPhone shots will become a frequent design in this book. I love saving pretty verses as my phone background, and this was inspired by a calligraphy piece I found a few weeks ago. The thumb is a little awkward, but over all I am very happy with this one! "Come to me all who are weary, and I will give you rest." It took me a while to decide which of my statement necklaces to use with Proverbs 3:3, but after receiving so many compliments on this one I knew it would work quite nicely. I sketched it in pencil, painted, then traced the design in black pen. I also had to spritz it in my favorite gold glitter spray. Because glitter. 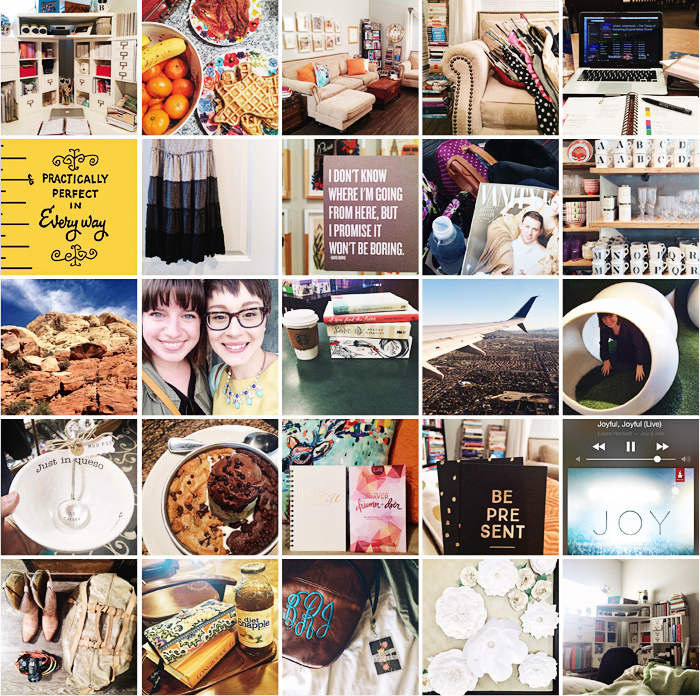 Follow the whole journey on INSTAGRAM, and let me know if you've joined in! 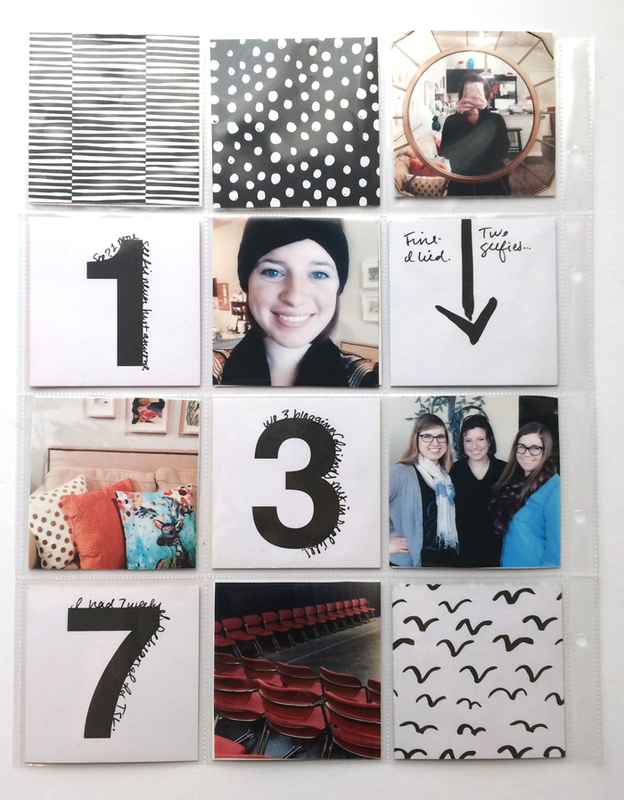 Project Life is scrapbooking made easy. The fact that I have found time for it in the midst of a crazy semester is a testament to that fact. I've put a pause on buying any more goodies to use what I have, and I brought a small box of my favorite supplies home with me for the summer to catch up on the last few months. Now how about a review? These are my first spreads for my 2015 album. Color-coordinating is my favorite thing. My first full spread! The center striped card on the left lets my first short-hair selfie shine through to the title page (which for some reason I didn't snap a picture of), and believe it or not this spread took the longest for me to put together. I had several clear pockets on my title page which meant I had to carefully select what would shine through. I also wanted to include my first big adventure of the year: cutting off almost a foot of hair! The before and after shots speak volumes here. When Studio Calico announced they would be offering a card set that collaborated with Lara Casey I almost jumped out of my chair! 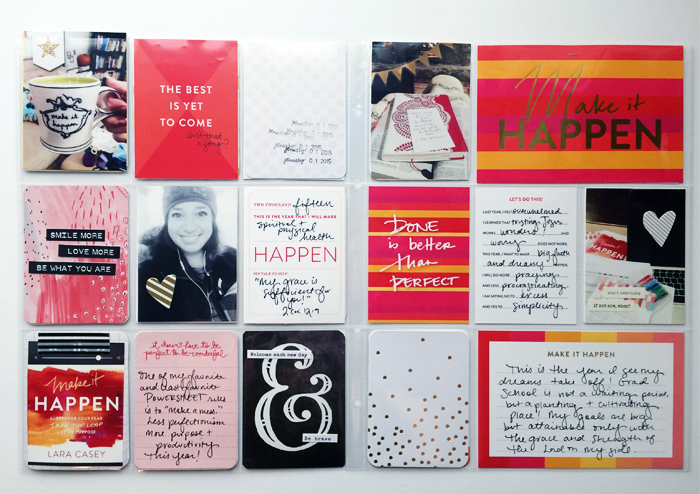 These cards provided a great space for sharing my thoughts on the start of a new year and to re-assess my goals now that the year is in full swing. I listened to Lara's book Make It Happen on Audible a few weeks ago and even picked up a hard copy, so these fit right in. Otherwise, these pages taught me how much I love using my own hand writing and the little typed phrases stickers. Those are sure to appear over and over again. I'm actually not a huge fan of this spread, but I'm giving myself grace as I go. 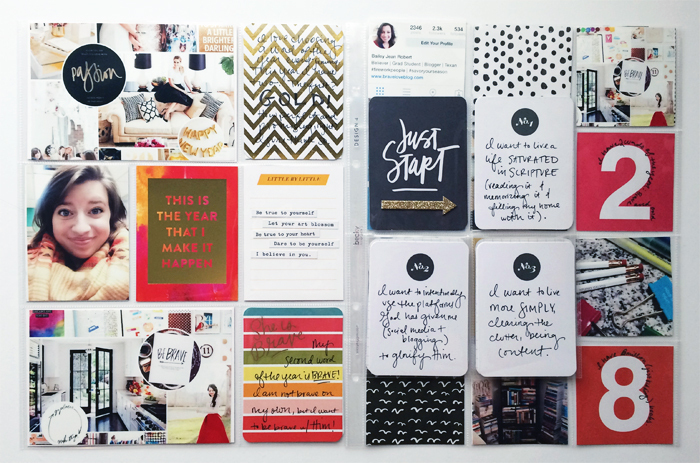 I wanted to include the collages I created for my two "Words of the Year" for 2015: BRAVE & GOLD, and I used a small insert with pockets that flip up and down to record my goals. I didn't get a detail shot of these guys but I will in the future. The page semi-hidden on the right put my first Messy Box into action, and I must say I like their style! More Messy Box goods here! This is the back of the right page above, putting numbers to some of the final images from January. I actually really like the simplicity of all the white space and the small black designs with pops of color in the photos. This may be the way I go in the future. One thing I struggle with is the desire to be instantly good at something, and Project Life is no different. I've been doing it for a while, but I'm still learning. Part of that learning process is making the decision to give myself grace and just keep going. Done is better than perfect, right? What about you? How do you keep your memories? Any other Project Lifers out there? 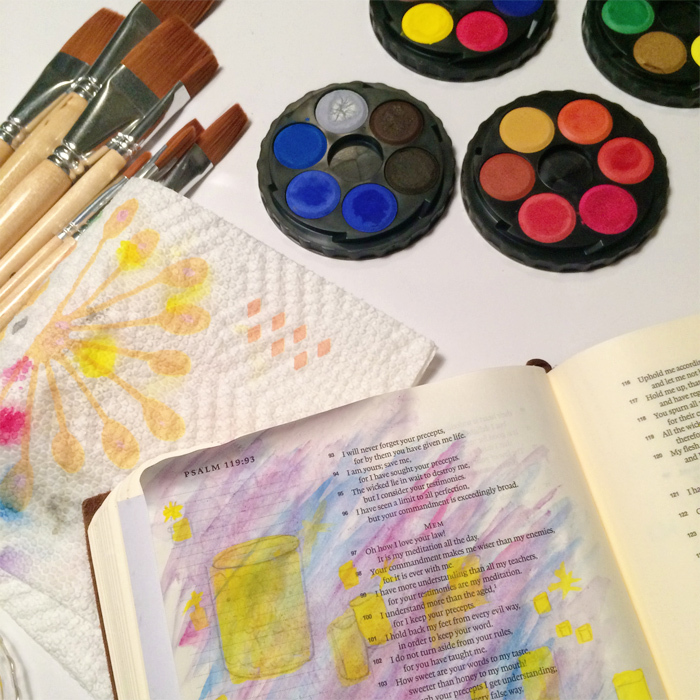 Last week I shared about my first attempts at Bible journaling. Today I want to give you a glimpse into my process. While many gals use scrapbooking stickers, alphabet stamps, and the like, I am trying to keep it simple for now. I would love to incorporate those one day, but for travel purposes I am limiting my supplies to watercolors, my favorite pens, and a glitter spray by Heidi Swapp pictured below. Typically I begin by sketching the image on a piece of scrap paper and testing colors there. Sometimes I'll have a verse in mind then hunt for an image, or other times it will start the other way around, first an image then a coordinating verse. Depending on how detailed the image will be, I will then sketch it into the Bible with a pencil. Most pencil marks disappear after the watercolors dry, but the act as a great guide for little ol' perfectionist me. You can barely see the sketch below. My test-sketch was actually for a right-hand page, so this took a little re-working. Up next comes the background and base colors. I have since purchased a paint pallet that includes purple and other versions of the basic colors, but it took me a few tries to get the purple/blue blend I wanted for the Tangled-inspired lantern scene below. I ended up going over the yellow with a thicker acrylic paint since the blue beneath it started turning the lanterns slightly green, and I swept over the sky with a glossy white to make it shine. **I have a small piece of thin cardboard that I slip beneath whatever page I'm working on to keep the paint/water from leaking through or catching any other pages by accident. Honestly, I haven't had any major bleeding of paint from one side of the page to the other which I was pleasantly surprised about! It really all depends on how much water you use. My original intention was to trace the lanterns in pen, but on a whim I used a thin brush and black paint for the sun and the outlines. It turned out much better than expected! Below is the final product! I spritzed the page with the gold glitter spray, which is hard to see in the photo, but boy does it shimmer! The verse itself was covered by one of the lanterns, so I wrote it in pen along the side to really emphasize it. A friend once asked me how I feel about completely painting over other scripture, and it was tough at first. 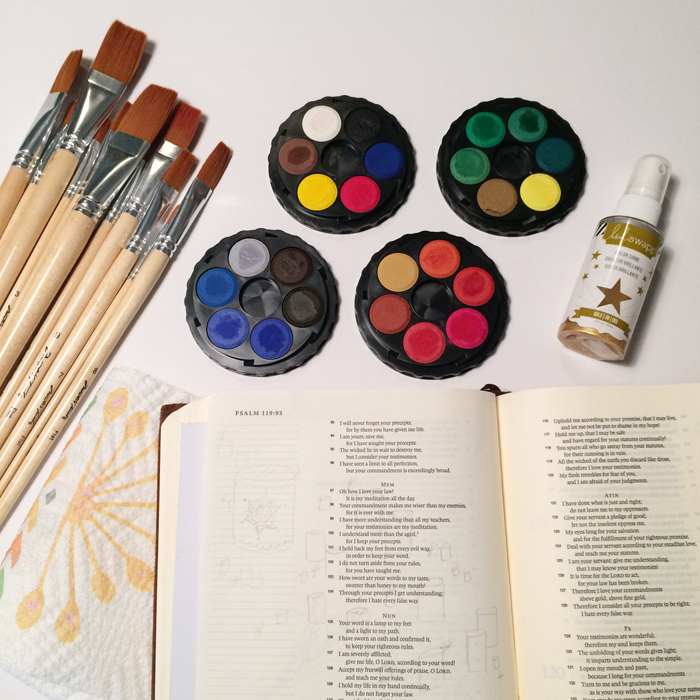 However, I have a NKJV Women's Study Bible that I prefer to use for actual study and my devotionals (or the YouVersion/She Reads Truth apps) so this Bible is expressly for painting/art journaling. I try to choose one verse to emphasize or a quote that matches the chapter so the rest of the page can be painted over. It is perfectly imperfect, and combines two of my favorite things: scripture and Disney. And this is just the start! Taking brush and pen to paint and paper, spending time in the Word more often, oh I want more of it! 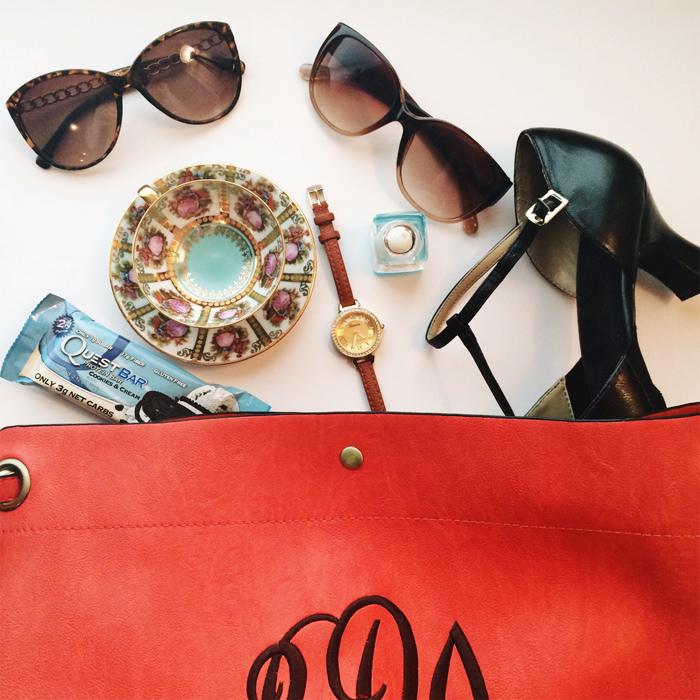 Thankfully, I have time for it this summer and a small travel pack to take it with me. You'll be seeing more of this in the coming weeks, both here and on Instagram. And if you've given it a go, I'd love to see! I'm always looking for inspiration here! Last spring I used the 100 Happy Days challenge to count down my LAST 100 days in Seattle. This year I picked it up a few months ago to count down the 100 days before I go BACK to Seattle. I'm in the 70's now and thought it was prime time for a little update. This round appears to be full of days spent at home, my spring break travels, and Hope Spoken. Not a bad 25 days I'd say! 1. A weekend at home was happily spent organizing and resting mid-semester. 2. Brunch shaped like home? Yes, please! 3. A clean home is a happy home, and this couch might be my favorite place to relax. 4. I cleaned out my closet (50+ items gone!) and it felt oh, so good. 5. Sometimes grad school me ands 3am library dates. Hopefully not too many next year. 7. A few gal pals and I hosted an Instagram sale from our closets. This pretty went fast. 8. My messy box came in the mail, and I can't get over this quote! 9. Traveling alone is the only time I buy magazines, making for a much-needed retreat. 10. Of course we stopped in an Anthropologie in Vegas. Is anyone surprised? 11. Hannah, her brother, and I hiked in Red Rock Canyon. And we got lost. Twice. 12. Isn't Pro beautiful? Almost a week with one of the Three Musketeers was good for my soul. 13. Sometimes an afternoon at Barnes & Noble is the perfect spring break getaway. 14. Off again! I headed to Denver for the second part of spring break to see the beautiful Micah. 15. We went to an art exhibit and it was.. interesting. So we played in the kids' room instead. 16. This girl loves her queso, and a bowl with a pun about it? Absolutely came home with me. 17. Pizookies are a gift from Heaven. Get yourself to a BJ's asap. 18. 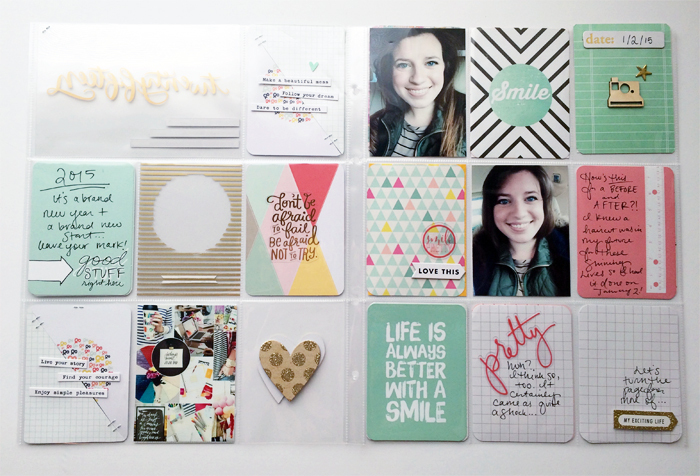 Two new goodies: a journal from Kristin Schmucker and Prayers for the Dreamer and the Doer. 19. Another monthly box from Studio Calico with a motto I'd love to live by: Be Present. 20. One of my favorite worship songs is "Joyful, Joyful" by Laura Hackett. 21. Off again! This time to a weekend in Dallas for Hope Spoken. Boots, camera, weekender, check. 22. A manicure and pedicure with a good book and tea? Don't mind if I do. 23. Hope Spoken was so good for my soul, y'all. I can't wait for next year. 24. These pretty paper flowers were all over the conference. Just stunning! 25. While going to bed early is the new sleeping in for me, sometimes I could stay all day. There you have it. The first 25 of 100 Happy Days. Have you taken the challenge? Try it! Cultivating gratitude and looking for the happy moments in your every day is a game changer. I promise. Trends fly around the blogosphere at lightning speed, and suddenly everyone is doing them. At first, I thought that is all that the Young Living Essential Oils frenzy would be, a passing trend. Several bloggers I admire started posting about them months ago, and while my curiosity was piqued, I chose to steer clear. I didn't want to hop on the bandwagon just because. No ma'am, no thanks. But the more I read about them, the more my curiosity grew. Could these little bottles full of natural remedies really work? Were they worth the investment? What if I join the wrong team? Do I really have time for this? The questions circled and circled at a dizzying pace. Finally, I put it on my goal list to save up for the premium starter kit to see what it was all about. That next weekend while at a trade fair with my mom we ran into the sweetest mother/daughter duo who had a booth about their oils, and they sealed the deal. These gals love the Lord so much and were quick to share their hearts behind the business and their efforts to go back to the gifts God gave in the garden, these natural elements that heal and help His people. They were SUCH a source of encouragement and joy that it made so much sense to dive in. I took the leap, and it has made all the difference! the how-to's which were so helpful. The spring semester was the hardest I had experienced in a long time, and I was suffering physically. I couldn't sleep, and when I did it was very lightly, leaving me awake much of the night. I was struggling with anxiety and overwhelm in a way like never before, paralyzed with fear and the inability to tackle what I needed to. I had also been experiencing food sensitivities and digestive issues for months with no known cause or remedy. After a little research and practice, I have found essential oil remedies that have helped tremendously! But what's the big deal, you might ask? 1. The community aspect of Young Living is how the business thrives. When you sign up for your premium starter kit, you join a team who are there to help and support you along the way. Dia and Martha are in my direct "up-line" and they have been more than willing to answer any questions and get me going from the starting line. Our team has tons of resources, such as Facebook groups, newsletters, and personal check-ins that can simplify the process and put answers at your fingertips. If you sign up with me, I will be in YOUR "up-line" and more than willing to help you dive in! 2. The results were shocking! I started putting Lavender on my wrists at night and diffusing it an hour before bed, and I started falling asleep so quickly and staying asleep! Two feats that had been nearly impossible for months. I had tried a different essential oil for my stomach troubles, but after ordering DiGize and applying it with coconut oil and a hot pad, I found relief within the hour whereas the pain would typically keep me up between 3-5 hours. And now I never leave my house without Stress Away, a lovely vanilla-smelling oil which has alleviated my anxiety (and doubles as a perfume!) with ease. I have now used every oil in my starter kit, and there are several I go to daily. These are no joke, y'all! 3. The joy of sharing with others seems to be Young Living-wide! Everyone I have encountered who uses the oils in real life or online seem quick to share their secrets (and the oils! ), so eager to help others find healing, rest, peace, whatever it might be. I have a few large resource books that have been so helpful, but I started out by searching through Pinterest for recipes. "Essential oils for Insomnia" was my first and tips/tricks GALORE popped up! My pinterest page is HERE with some of my favorites. There are also Facebook groups where questions posed are answered within minutes, and everyone seems truly delighted to do so. 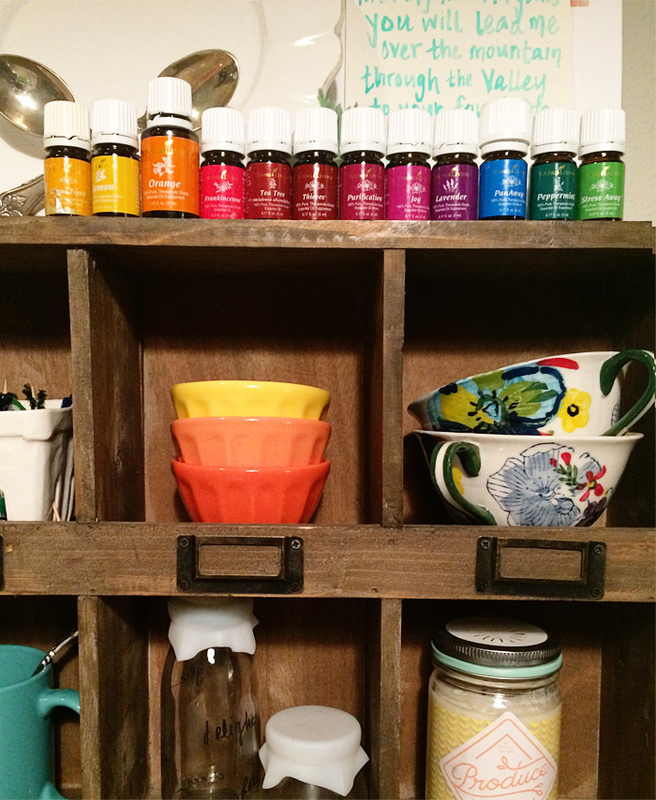 I will sharing my essential oils journey here on the blog as well as @lemonloveessentials on Instagram. 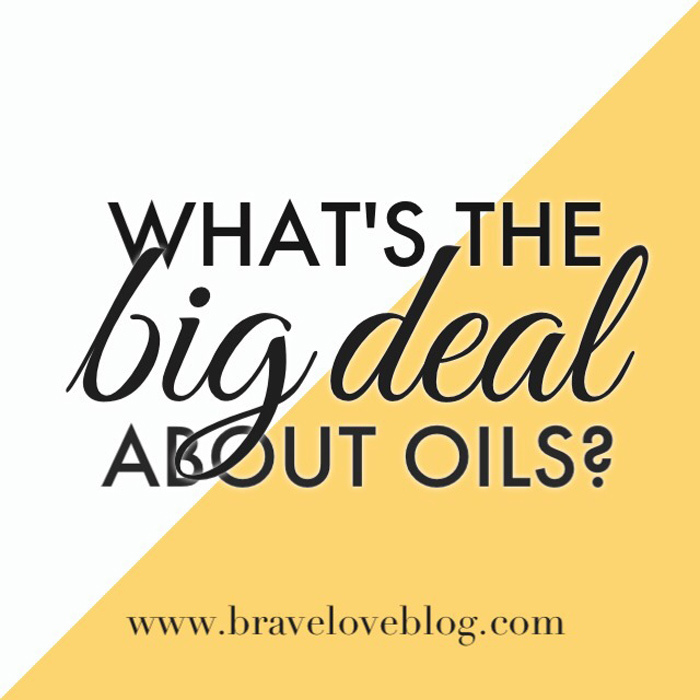 You'll get a glimpse of how these oils are used in daily life, new discoveries as other oils arrive, and my own recipes/tips/tricks that I come up with along the way. If you have any questions, feel free to leave them in a COMMENT on this post or SEND ME AN E-MAIL at lemonloveessentials@gmail.com. I will do my best to make the starting process as care-free as possible! You'll be added to my team and get $300+ of oily goodies for half the price! Again, if you have any questions, send them my way! Over the years I have gone back and forth about the way I approach scripture. The Bible has always been something so familiar, read at church each week and at the start of every school day for most of my education, and somewhere along the way the novelty and splendor of it wore off. I felt like I knew it backwards and forwards, and I was the queen of "sword drills" (races to see who could look up a verse the fastest), but the light over this book dimmed as the years went by. Writing out the verses has always helped me to memorize them, but I wanted to approach it more intentionally this year as that practice had fallen away quite a while ago. I picked up a journaling Bible several months ago but did little with it, typically using my YouVersion app for reading instead, and it wasn't until stumbling upon Shanna Noel and her hashtag for Illustrated Faith that I decided to dive in. The perfectionist in me was suuuuuper hesitant. It's what stops my progress on most projects, but I am so glad I put the paint on paper! 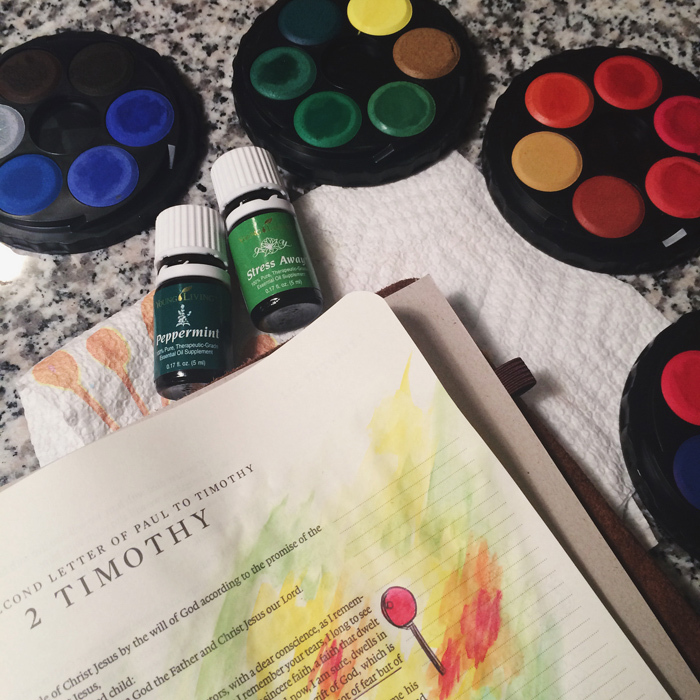 I use watercolors to paint a page a day and it has been so good for my soul, relieving stress and anxiety, and making the scripture leap off the page. I've found it so much easier to remember the verse when I have a picture to attach to it! Here are a few of my first pages. "For you formed my inward parts; you knitted me together in my mother's womb. I praise you, for I am fearfully and wonderfully made. Wonderful are your works; my soul knows it very well. My frame was not hidden from you, when I was being made in secret, intricately woven in the depths of the earth." Another trend I've seen floating around Instagram and Pinterest are cute little cacti with bright pink blooms, both prints and physical plants. Aren't they cute?! I'd buy them up if I could, but I am terrible at keeping plants alive (I know, I know, it's a cactus, but still... if anyone could kill one, it would be me). So instead I planted it in the book of Micah and wrapped verse 7:7 around it. It doesn't correlate with the verse like the weaving above, but I liked it anyway. Oh man, I will not soon forget this page. Or ever. During my last week of school Oklahoma got some crazy weather. I'm talking tornado's, hail, and rain GALORE. I was terrified! My plans of driving home to Texas were put on hold until the weather calmed down, but one Friday night I sat nearly paralyzed in fear on my couch watching the radar and the storm raging outside. After an hour of this I decided to take some action, putting on the Bethel Music Pandora station, dropped Peppermint and Stress Away into my diffuser, and started to paint. I stuck that very scary radar smack dab in the middle of 2 Timothy 1. "For God did not give us a spirit of fear but of power, love, and a sound mind." As for the Bible I use, it is a single column ESV journaling Bible with a leather wrap-around cover. Christianbooks.com typically has them for a steal of a deal like this one HERE. I bought a set of watercolors at my campus bookstore and a second set with more colors at Hobby Lobby. Both sets were under $10.00. Really any brushes will do, and I am still in the learning process as far as actually painting goes. But some of what I would consider to be the "imperfect places" are becoming my favorites. 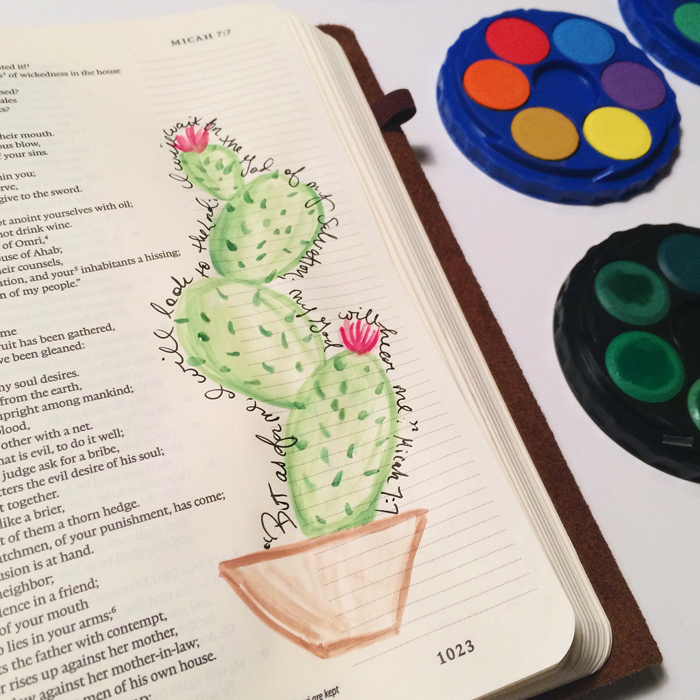 Have you ever tried creative Bible journaling? Writing in the margins? What is your favorite way to connect with scripture? I'd love to know! Me, oh my. This is one for the books. I've been known to carry some crazy things in my purses (like plastic swords and Captain Hook's hook) and during finals last week I looked down from my seat in the library and nearly laughed out loud at the contents of my bag. Finals week always leaves me in a frenzy, but Thursday was something special. Somehow I ended up with two pairs of sunglasses. One is from Francesca's and the other from a local boutique. Strangely enough Thursday was rainy and overcast. ALL DAY. No need for sunglasses. Black T-strap character shoes are the way to go. And that acting final though. Heels and a rehearsal skirt were a requirement for the final, so in the bag they went. I've never been a watch kind of girl until I bought this one. The thin strap and rhinestones certainly help. My sister is crazy about her QuestBars so I thought I'd try a few. Thus far, the cookies and cream flavored one is my favorite. I buy and lose chapstick all the time, but I've kept up with the Softlips Cube for quite a while. I got it in an Influenster Box last year and I highly recommend them! And there you have it. Finals week is in the bag, literally and figuratively. On to sweet, sweet summer! I remember it like it was yesterday: my first fascination with the library. Our school was small, tucked in the Sunday school classrooms of a local church, which mean the library was miniscule. The balcony of the sanctuary had been closed off and turned into more classrooms, and the smallest section was designated to house a couple hundred books and two dozen wide-eyed (or tired-eyed) students every other hour. I was in the fourth grade when I learned this room was a haven. (I was in the third grade when a library volunteer broke our hearts about Santa Claus in that very room, but that's a different story entirely...) The Mandi mystery series was my addiction of choice and it escalated from there. In the sixth grade my bestie and I combined even our lockers so one could hold our school things and the other could act as our personal library. We were writing a book ourselves and it shared sacred space on the shelf with Elsie Dinsmore and her adventures. I found said book a few weeks ago, all 116 pages of it, and boy have I improved... and I now laugh at how young our leading ladies were. Seventeen is not so grown up after all, but at age ten it sure felt like it would be. Anywho. Back to books that were written by someone else. My fascination with the library turned into a fascination with building my own, and I collect books like a mad woman. They overflow from my bookshelf, piling on the floor as I do my best to burn through them. In 2014 I made a goal to read 12 books in 12 months. I ended up with around 20. This year my ambitions aim a little higher. My goal this year is to read 100. Actually the goal is listed as "100 Books I Don't Have Time to Read" which could not be more accurate. I've read 16 so far and with the arrival of summer break I plan to blaze through a few dozen more (hopefully) before the fall semester rolls around. Be still my heart. This book was oh, so good, and such sweet honey for my soul. The hard times are still the good times, and God is good ALL of the time. I love Sara's approach to praying scripture, her monthly adorations and the way she declares the goodness of God through all her trials. This book was my faithful companion flying for spring break, and I would highly recommend it! Any other Pride & Prejudice fans out there? Or Downton Abbey? Well, lucky for you this book combines the two. Longbourn is the home of the Bennet girls, and this book takes us to the heart of their story, only from the perspective of the help, particularly Sarah, the maid, and her hope for more out of life than laundry and looking for reasons to dislike the new stable boy. I could not put this book down! It is a must read if you're looking for a new fiction find. I first heard of More Love Letters on Tumblr, and I have to admit this book flashed itself all over Instagram simply begging me to bring it home. I perused it over spring break and was so engrossed (admittedly thirty pages in while still at Barnes & Noble) so I knew it was a done deal. Hannah is honest and raw, and her heart is pure gold. This book has stirred something inside of me to go out, do good, and dream big with Jesus in a way no book has in a long time. Check it out ASAP! Oh Audible, how do I love thee? Let me count the ways.. But seriously, downloading this as an audio book for my long drive from TX to OK was one of the smartest decisions I made all semester. I loved "The Lizzie Bennet Diaries" web series (again, I'm a Pride & Prejudice nut), and I was delighted to find out that the gal who played Lizzie did the recording. She does all of the voices SPOT ON and The Secret Diary takes you further into the plot than the weekly videos did. I personally recommend watching the series first, but I still think you can get plenty out of this. But it is one I'd recommend the audio book over the physical book, simply because Ashley Clements is stinking hilarious. Again, Audible is my new favorite thing. Shauna recorded her book Bittersweet and listening to her read through her triumphs and trials in that soothing and encouraging voice of hers warmed my heart. I had picked up a physical copy of Bittersweet a few years ago but never finished it. This book was truly a delight! Can I have Lara Casey narrate my life? Or at least give me a pep talk every morning? I preordered this book to arrive upon its release, but I had no time over the Christmas break to read it. THEN when I found out that she had recorded the Audible version, I was all over that so fast. Her podcasts and interviews are always my favorite, and I am a dedicated PowerSheets user + Southern Weddings Magazine follower, and this book was her heart in paper (or recorded) form. Go. Listen. NOW! The legend presented at the beginning of this book is incredible, and I am eager to see what Batterson has to say upon further reading. I want to cultivate a powerful and persistent prayer life, and this book came highly recommended. I'll keep you posted, but so far so good. "What we perceive as unanswered prayers are often the greatest answers. Our heavenly Father is far too wise and loves us far too much to give us everything we ask for. Someday we’ll thank God for the prayers He didn’t answer as much or more than the ones He did." I may or may not be obsessed with the royal family... and by that I mean I am absolutely fascinated by them! I'm a big fan of the Cinderella story, and I was absolutely one of the few, the proud, the crazy that awoke at 3am one April morning to watch Kate Middleton emerge in a STUNNING wedding gown and become the Duchess of Cambridge. So when I spotted this book on the shelf at Barnes & Noble, it practically screamed my name. I gave it a test run, reading the prologue and the first chapter before ordering it on Amazon. My intention was to read it on the plan to South Carolina later this month, but I've already reached for it twice, so it may not last that long. I'm also reading Essentialism and Harry Potter and the Goblet of Fire which should not surprise anyone as I'm never reading fewer than four books at once. If you haven't checked out Audible, I obviously highly recommend it, and I look forward to seeing which of you picks up the books listed above! Now it's your turn! What are YOU reading? Any recommendations? Send them my way! If I'm not careful, I will scroll the day away on Pinterest or Tumblr, admiring the gorgeous images, planning parties and living rooms and DIY's that I don't have the time/space/budget/you-name-it for right now. Even so, I find it refreshing. But these days I find myself browsing Etsy far more than the sites above. I have accumulated quite the favorites list over the years, and I thought I'd share a few recent finds. You can never have too many monograms in my opinion, and I want all things BJR these days. 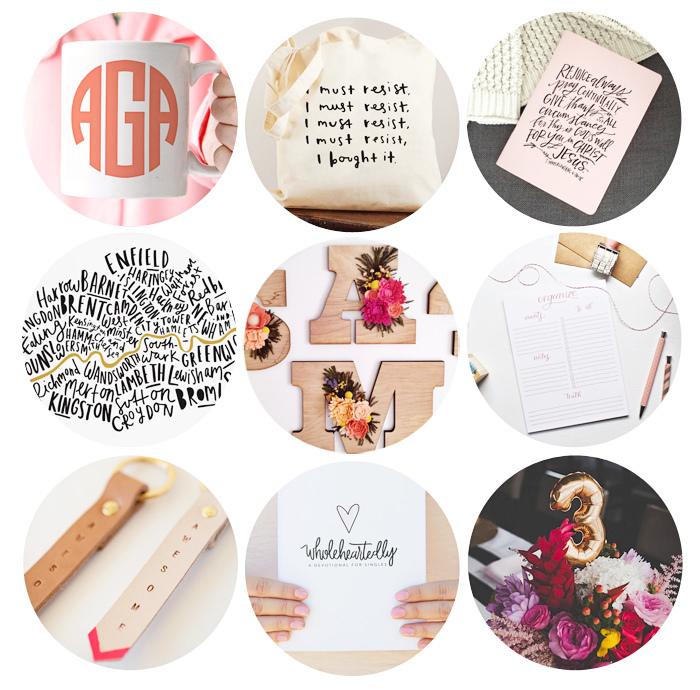 From bags to vinyl decals, rain coats to mugs, you can find pretty much everything your heart desires on Etsy and get it customized to your liking. Now the prayer journals by Val Marie Paper are not new to me. In fact I am soon to complete my first one for 2015 and start the second (pretty and pink!) one for the latter half of the year. If you are looking to cultivate a more intentional prayer life or to simply get started somewhere, I highly recommend these! I've been putting the finishing touches on my living room and the travel theme continues. I love this print of the London boroughs and am debating on tucking it in the collage behind my TV. I picked up a few canvases over the weekend as well as some empty frames, so it might fit nicely. These felt-flowered letters first appeared during Hope Spoken as a gift for the sponsors, and I've been eyeing them ever since. I don't know that I have the time or the patience to DIY them, but I can stare wide-eyed and envious of these pretties any day! Pretty paper goods catch my eye every time, and this organizational notepad has been in my favorites for weeks. 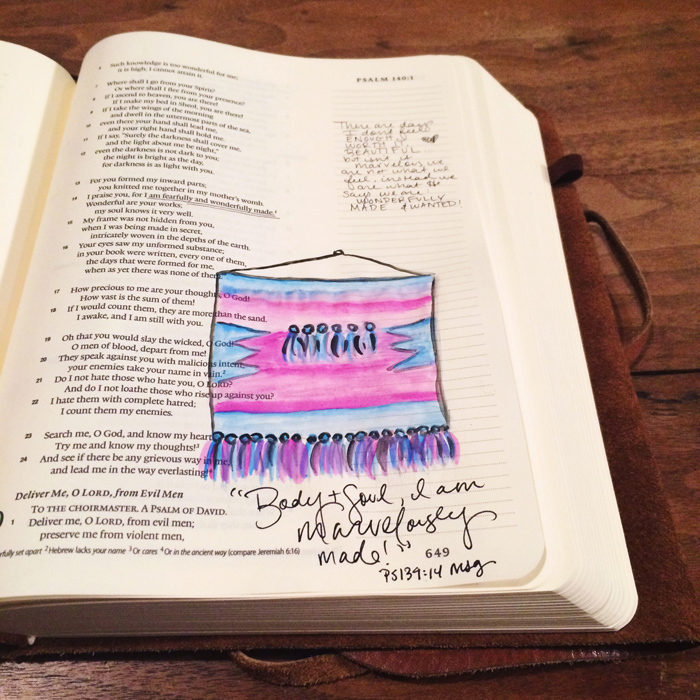 There are sections for to-do's, events, notes, and even a section for a quote or scripture along the bottom. Don't mind if I do! My keyring is already pretty full, but these awesome key chains and their pop of gold and neon could not go unnoticed! Simple and chic, how fun would these be?! Remember the prayer journal I mentioned above? Val's twin sister Natalie has written the Wholeheartedly Devo for singles and it is INCREDIBLE! Saturated in scripture and thought provoking questions, this is a must-have for any single gals wishing to savor their season. Run -don't walk- to snag your own! There you have it, friends. Anything catch your eye?